Are 36-million pixels too many? The excitement surrounding the announcement of the full frame Nikon D800 has been unprecedented. The performance section of this review has been updated with a comparison to the Nikon D700. One of the key topics of conversation about the new camera has been its class-leading effective pixel count of 36.3 million – perhaps proving that the pixel race is not over, and that numbers still really grab the headlines. Could such a high pixel count be the D800's undoing though? The D700 below the D800 in the Nikon SLR line-up, has just 12-million effective pixels and until recently Nikon's mantra had been that 12-million pixels is enough if the images are clean. Nikon also has a strong reputation for its cameras' low-light performance and noise control. Could 36-million pixels be a step too far, too soon? Although it has a more densely populated sensor, the 36.3Mp D800 utilises many of the new features of the previously announced 16.2Mp D4 in a smaller body and at a cheaper price. These include the same EXPEED 3 processor, the same Multi-Cam 3500 FX autofocus system, which offers 51 autofocus points and the same 91k-pixel metering system. It's also capable of focusing right down to -2 EV, which coupled with its ability to shoot at up to ISO 25,600 (at the Hi 2 setting), should make the D800 a promising camera for low-light shooting if image noise is at an acceptable level. Given its effective pixel count, it's not really a surprise that the D800 has a lower maximum continuous shooting rate than the D700; but at 4fps (the D700 can manage 5fps) at full resolution with the standard battery and 5fps (D700 8fps) with a battery grip it's no slouch. This can be boosted further by dropping the image size to capture DX format images. As with the D4, the D800's central 11 AF points are capable of functioning at f/8. This means that the AF system will still function when teleconverters are used to extend the reach of telephoto lenses. This is great news for wildlife photographer who want to avoid the expense and burden of carrying a selection long and heavy optics. For instance, a 200-400mm f/4 fitted with a 2x teleconverter effectively becomes a 400-800mm f/8, and unlike with the Canon EOS 5D Mark III, the D800's autofocus system will still function. The Nikon D700 doesn't feature a video mode, but the D800 brings full HD functionality. It can record 1080p video at 30, 25 and 24fps frame rates, along with 60 and 50fps rates at 720p for shooting slow-motion movies. Both FX and DX crops are available in video mode, although the D800 lacks the D4's useful 1920x1080 crop mode. In another upgrade over the D700, the D800 features dual memory card slots. Unlike the D4, the D800 makes use of existing memory card formats, namely Compact Flash and SD/SDHC/SDXC. The decision to include two formats might prove frustrating for some pros, who will now have to carry two different sets of cards. The shutter has been tested to around 200,000 cycles, while the battery life has been reduced from the D700 to around 850 shots at CIPA standard. While the D700 was capable of around 1,000 shots, the new battery has been made to comply with a new Japanese electronics law, hence the reduction in shot output. Since the measured battery life (850 shots) includes the use of flash, it's likely that the battery has the potential to last even longer, depending on the situation. It's worth noting here that the D800, like the D700 has a built-in pop-up flash unit (GN 12m @ ISO 100) which is useful for providing fill-in light and triggering external lights wirelessly. The Canon 5D Mark III doesn't have a flash built-in. 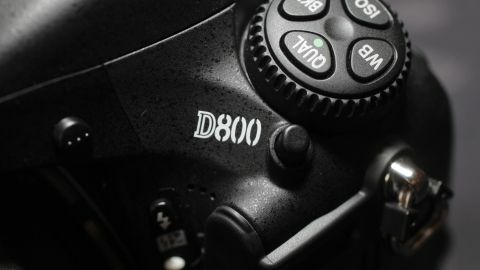 The D800 is available in two versions: a 'standard' body, plus a special edition, called the D800E. The latter has a modified filter over the sensor that has no anti-aliasing qualities and comes with an extra £300 premium as a result. Removing the anti-aliasing filter allows for a potentially greater amount of detail to be resolved and comes at the price of increasing the chances of false colour or moiré patterning, which may require some extra post-capture processing. Fortunately, this type of interference is relatively straightforward to remove in photo-editing software packages, such as Adobe Photoshop Lightroom 4. Nikon's own Capture NX2 can also be used to reduce or remove the effect, and will come bundled with the D800E. Altogether, Nikon claims to have included 36 new features or improvements to this full-frame SLR, when compared to the Nikon D700.